The Acura RDX is a smooth and sophisticated compact crossover with the latest technology. It comes with a smooth 3.5-liter V6 that makes 279-hp and 252 lb-ft of torque, coupled to a 6-speed automatic with paddle shifters. The RDX competes with the Mercedes-Benz GLC, Volvo XC60, Audi Q5, BMW X3. One of the changes for 2016 is a small increase to the horsepower and torque. The nose and tail have also been tweaked. Inside, heated front seats and climate vents in the rear are now standard. The EPA fuel mileage is 20/29/23 mpg City/Highway/Combined; with all-wheel drive it’s 22 mpg Combined. And that’s on Premium fuel. Here it loses big to the Volvo XC60, whose turbocharged 2.0-liter engine delivers 26 mpg Combined and runs fine on Regular. In the RDX, three of the six cylinders shut down to improve fuel mileage when not needed, and fire back up when they are. The driver can’t feel or hear any of this. The RDX feels like a boxy Acura sedan. Its tidy size and nimble response make it maneuverable in tight spaces and easy to park. Its balance in the curves makes it enjoyable to drive on winding two-lanes. It handles more lightly and less sporty than a BMW or Audi. AWD with Intelligent Control is what Acura calls its all-wheel-drive system. It’s been tuned in 2016 to increase the power to the rear wheels, making the RDX feel and behave a bit more like a rear-wheel-drive car under acceleration. With 2WD, traction control is standard. Six airbags are standard, along with a rearview camera. Safety ratings for the 2015 RDX are excellent (2016 not done yet), with five stars from NHTSA and Top Safety Pick + from IIHS. The front-wheel-drive RDX retails for $35,270 MSRP, and with AWD Intelligent Control it’s only $1500 more. Tech Packages for each model raise the price another $3700. 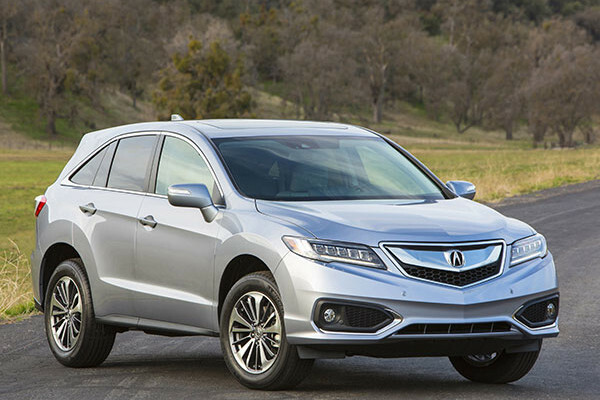 For 2016, Acura RDX gets a new front and rear end. The headlamps dazzle, a row of five LEDs like a string of diamonds. A new fascia underlines the emphatic angular grille, which kind of looks like a beak, better on the Acura SUVs than the sedans. At the rear, new LED taillamps are a light-pipe design. The roofline is low and arched. Muscular fender arches around new-for-2016 wheels enhance the attractive profile. The RDX shares its structure with the Honda CR-V, making it a five-seat compact. The front seats are comfortable, with eight-way adjustment and a tilt-telescope steering wheel so six-footers are fine. But in the back, three people get crowded, even if they’re small. Two adults in front and two kids or teenagers in back is optimum comfortable seating. Still, the RDX has nearly two more inches of rear legroom than the Volvo XC60. The instrument panel offers both form and function, with controls that are easy to find and use. Soft-touch materials and matte surfaces make it upscale, despite too many bright bits. The controls are canted a bit toward the driver but don’t crowd him or her. There’s good storage space in various bins, including slots for 23 CDs in the center console, as well as the perfect shelf for a phone and nearby slot for charging. The rear seats don’t fold flat, but there’s 61 cubic feet of cargo space when they’re down (BMW X3 has 63), and the cargo floor is low in the rear. Under that floor, there’s another 15 cubic feet, and that’s a lot. The six horsepower increase in the smooth V6 is fine, but a bigger improvement to the engine is the broadening of the torque range. This makes it more responsive at almost all engine speeds, especially improving drivability around town. Its quickness from 40 to 70 mph makes passing on two-lane roads secure, while the torque keeps the transmission from having to downshift. The RDX is pleasant to drive on winding roads. It’s quite refined, with new active rear and front engine mounts, updates to the steering control system and increased suspension mount stiffness, all reducing vibration and jolts on rough roads. The Acura RDX is a premium vehicle with a smooth and powerful V6 whose downside is that it rates EPA-estimated 23 mpg Combined and needs Premium gasoline. It has nimble handling, a solid ride, strong safety results, and a classy cabin with good cargo space. Driving impressions by Mitch McCullough. Sam Moses contributed to this report.